Here at P-O Life, we’re far from being experts on the subject, so refer you to RIFT for all the information you need for your application. Instead, what we can do is share with you readers’ experiences of applying for the Carte de Séjour to make your visit to the Prefecture as hassle-free as possible..
DO YOU HAVE A CARTE DE SEJOUR EXPERIENCE THAT WOULD HELP OTHERS IN THEIR APPLICATION? PLEASE CONTACT US. WE’D LOVE TO PUBLISH IT. Our meeting was conducted in a very friendly ; very low key, pretty random manner. Having read many varying experiences on Facebook blogs our meeting was not particularly demanding. In fact we found we had prepared more than sufficient information to satisfy the interviewer. We were proactive throughout the 45 minute meeting frequently suggesting additional pieces of evidence that might help the interviewer. The last thing we wanted was to have to return with additional evidence we had not made available at our original meeting. We used our CdS application as an opportunity to reorganise our existing files in a more co-ordinated manner making the collation and preparation of information that more straightforward. While we were not asked for one translated document we had most key documents professionally translated to support our previous Carte Vitale applications. We felt it appropriate, respecting the extra work involved examining documents in an unfamiliar language. We used Deepl to translate non-key documents. Along the same vein we converted all documents quoting £ sterling to € Euros. The 45 mins enabled the interviewer to collate the necessary information and complete both of our forms. We collected our card today in Perpignan a month to the day of our interview. The card is for 5 yrs. Our experience is similar to others in that it is best to get to the Prefecture early as only 22 tickets are issued for each session. The opening time is 9am and despite arriving at 8.40 there was already a queue of approximately ten people. Having received a numbered ticket from the receptionist the whole process was completed in 40mins. Beside the letter indicating our CDS was ready, the only other documents required were our passports. Today we attended our rendez-vous at the sous-préfecture in Perpignan for our carte de séjour. We thought that it might be useful to let you know about our experience so that you can share some or all of it with others if you think it would be worthwhile. We received the date of 12th November 2018 for our rdv way back on 20th July 2018. We believe that the waiting time is even longer now. Our rdv was for 10h45. We arrived at 10h25 expecting to have to wait in a queue quite a while but, once through a swift but thorough security check at the entrance, there was was someone triaging arrivals and we were quickly directed to a nearby waiting room. We were summoned to a guichet at 10h44 and had a very helpful, knowledgeable and business-like lady behind the glass screen. We are a married couple applying for a carte de séjour each in our own right. We are both retired. This dictated what pièces justicatifs we had to provide. We were dealt with consecutively (rather than simultaneously). We were each asked for two piles of documentation – one with all the originals and the other with all the copies (not, as we had done, which was to have one pile with the copies immediately under the originals!). 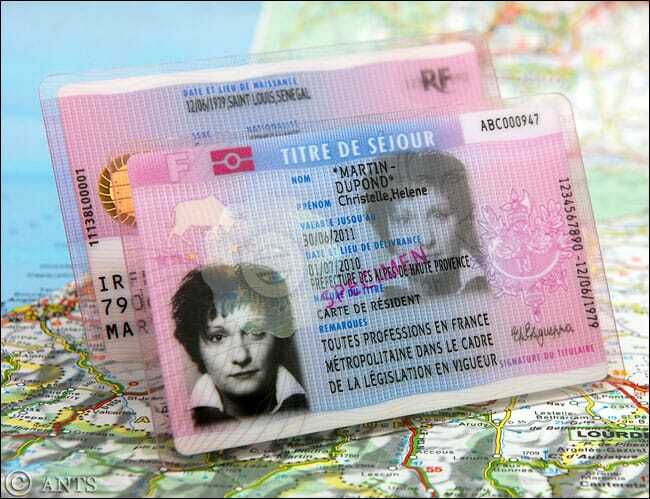 The Interior Ministry list of Pièces Justicatives specifies three ID photographs – but Perpignan only uses two and gives you back the third one. Nevertheless take three! YES – even though they are not on the Interior Ministry list, we were asked for our birth certificates and our marriage certificate (right up front in the rdv). Make sure you take them. Another Perpignan requirement that’s not in the Interior Ministry’s instructions is for married couples to have a photocopy of their spouse’s passport in their dossier. Both parties need to be present to sign the Declaration de Communauté de Vie (consult the link https://droit-finances.commentcamarche.com/faq/23659-communaute-de-vie-definition for what this means) on the back of each Demande de Titre de Séjour form. We offered our cartes vitales (and copies) and our Attestation de Tiers Payant (mutelle) card (and copies); that seemed to be useful and they were accepted willingly. For the Justicatif de la continuité de résidence pendant 5 ans, one document per semestre (i.e. every half-year/six-month period) is required. No translations were required of any documents in English. Their e-mail giving us the appointment date and time stated “Pour l’obtention d’une carte pluri-annuelle, vous devez impérativement présenter votre Contrat d’Accueil et d’Intégration (CAI) ainsi que vos diplômes”. We had never heard of these and after some research on the Internet, decided that they were not applicable to EU citizens. So . . . we took the risk and ignored the requirement. We were not asked for them – thank goodness! Finally, after many smiles and the exchange of vast amounts of paper, we walked out at 11h10 having been told that we would be granted a 10-year carte which should be ready in one month. On verra ! In view of the anxiety and uncertainty (mainly in my head!) over the future effects of Brexit, I have just applied for a Carte de Séjour. While none of us ‘ex-pats’ in France think that we are going to be asked to leave next March, many of us feel that it is better to do ‘something’ rather than ‘nothing’, and applying for a Carte de Séjour appeared to be a good option for me. Firstly I emailed the Prefecture de Perpignan with my request and they replied very quickly, attaching the form to fill in, together with the list of all the documents required (no mention of a Birth Certificate), and offering me a rendezvous in 3 months’ time. Page 1 was pretty easy – Valid Passport, Proof of Address, 3 recent photographs (took some time to get one I wasn’t too ashamed of). I also managed to rustle up an impressive batch of documents showing my self-employed status; ie ‘auto-entrepreneur’ declarations. Strangely, there was no request for a copy of my Birth Certificate. Then it got more interesting. They needed proof that I have been resident in France non-stop, apart from holidays, for the past 5 years, one document per trimester for each of the 5 years – ie 20. With a slight pang of guilt at destroying yet another rain forest I duly printed out the relevant pages of bank statements. As a double back-up I also photocopied garage bills, prescriptions, a cat kennel bill and as my ‘piece de resistance’ attached a copy of my dog’s Pet Passport showing more than 5 year’s worth of dates! They still didn’t ask for a copy of my Birth Certificate. On the appointed day, armed with all my paperwork (but not my birth certificate as it wasn’t on the list of required documents), I arrived at the Prefecture. A security guard asked if he could do a search of my handbag – I have no idea what would have happened if I had said no! I had imagined the application interview to be a formal affair but arrived at the relevant booth in front of a girl who looked about 14 years old! She flicked through my paperwork, didn’t seem interested in any of my vet or dentist bills, asked to see my Carte Vitale (equivalent of a Health Card) and made a copy of it – even though there was no mention of this being a requirement on the official list. She then stamped something, stuck my picture on a document, stamped it again, asked me to put my fingers on a machine to take my finger-prints – and asked for a copy of my Birth Certificate. I don’t know if I’ve mentioned this but nowhere on the list of documents do they say that they require a copy of the applicant’s birth certificate. She admitted this was the case but shrugged her shoulders, (as only french bureaucrats can do) looked almost apologetic, (very rare) but said that they needed it. – but not to worry, I could put it in the post and then my Carte de Séjour should arrive within 1 month! I have now sent the photocopy of my birth certificate (but not translated into French) and am crossing my fingers that they will manage to put it in the file with the rest of the documents and that I will receive my Carte in the post. If not, is anyone available to pick me up from Dover on 30th March next year…..? end of July. Very pleasant interviewer, fingerprints taken and told to expect CdS to be ready for collection in about 5 weeks. In fact only waited 3 weeks, and now we both have max. 5 year cartes. avis d’impôts, which provides conclusive evidence of all income. Whatever you do, take all the originals with the photocopies and don’t forget to photocopy everything as they will not do photocopies there. I had my Perpignan rdv September 3rd, documents were accepted, no surprises, friendly lady interviewer. Fingerprints taken, told to expect to hear from them in 4 weeks. Waiting….